2013 is not a year that Paschal Connell will forget in a hurry. 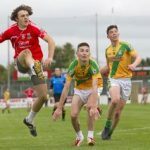 He turned 18, won a Leinster minor title at Croke Park with Kildare and last Sunday he captained Athy to the club’s fourth minor success in six years. “It was great winning in Croke Park but today (county minor championship final) is special in the sense that you are playing with lads you went to school with, lads you know your whole life. I live up the road from Tadhg Foley, we spent our childhood together and it’s great to win with your best friends. I’m not complaining about winning at Croke Park but today is just a great feeling,” he said. Connell was lining out against some players who had been team mates in the white of Kildare over the summer and he particularly enjoyed the midfield battle against county skipper Mark Sherry. “Mark is a good friend of mine so I was just happy to play alongside him. It’s nice to win, it’s a great feeling. The likes of Mark Sherry and Chris Healy, they’ll be representing Kildare in a few years. I think we’re lucky we got them now, it might have been a different score in a few years time,” he said. Athy were a little slow to start but Connell said that their opponents deserve a lot of credit for that. “Two Mile House are a very good team, we might have been a few points ahead but they showed real character. We knew they were always going to come at us, they are an absolute credit to themselves. I’m just delighted that we got out on top,” he said. This latest success continues Athy’s recent tradition at minor level but that is all down to the work done behind the scenes from men like Mick Kelly, Joe Kelly, Shane Purcell and Joe Kinahan. Connell’s next aim is to make his mark at senior level.